Do you have leadership potential? 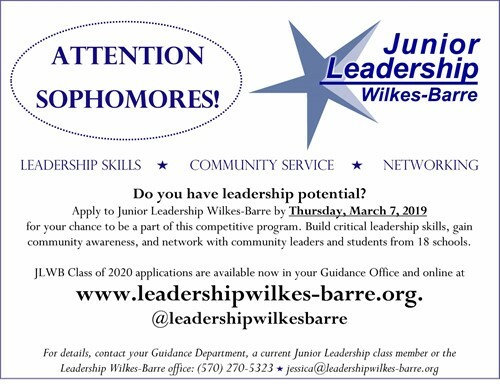 Apply to Junior Leadership Wilkes-Barre by Thursday, March 7, 2019, for your chance to be a part of this competitive program. Build critical leadership skills, gain community awareness, and network with community leaders and students from 18 schools. JLWB Class of 2020 applications are available now in your Guidance Office and online at www.leadershipwilkes-barre.org.